Men in Sheds is an innovative project that supports older men who want to get together to share and learn new wood-working and other skills and subsequently form friendships. . The new Oswestry Men's Shed follows many other successful predecessors across Shropshire and indeed across the UK. The ‘shed’ is a safe, friendly and inclusive space for men to enjoy. Shed members are very much involved in the development of the “shed” and choose the activities they want to participate in and what products should be made to sell or take home. 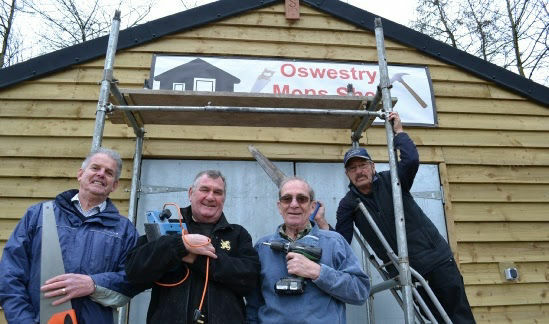 The Oswestry Mens Shed has been set up to provide (primarily) men with a dedicated space where they can make things, socialise, share skills or just enjoy a cup of tea. “Men in Sheds” as an organisation started many years ago in Australia. A Shed is a community-based group of people who's aim is to provide a safe, friendly and healing environment as a meeting place. It is an innovative project that brings together men who have time on their hands and want to get together to share and learn new skills, form friendships, have a joke and generally enjoy themselves in a warm and inviting environment. Men in Sheds aims to address social isolation and provides an opportunity for men in later life to get involved in productive activity, all whilst enjoying the benefits and banter of a social group. As a group, we try to provide, through the coming together of like minded individuals, a safe, supporting and friendly community aimed at sharing all of our skills, knowledge and experiences. Shed members come from a wide variety of backgrounds ranging from highly skilled joiners, wood turners and engineers to beginners; there is a role in the shed for everyone. Basically, the shed is a place for skill-sharing and informal learning, of individual pursuits and community projects; a place of leisure where men come together to have a sense of purpose and social interaction. We feel that we have established an environment where members are encouraged to contributed and create unique or general projects specific to their own aspirations. All members regardless of their interests are considered to be contributing to the diversity within ‘The Shed’. Although everyone seems to enjoy themselves in what they do it is vitally important that we respect the need for health and safety issues and create an environment where safety of all is paramount. All in all we feel that we have created a happy and welcoming environment where the traditional male workplace communication styles are.